Two of America’s most beloved comedians will bring their new stage collaboration to the Center for the Performing Arts on September 26th, 2019. 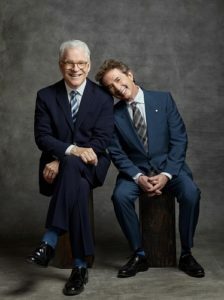 Comedy legends Steve Martin and Martin Short perform musical sketches and reflect on their iconic careers in the new show, titled Now You See Them, Soon You Won’t. Joining them are the all-female bluegrass band Della Mae, banjo innovator Alison Brown and keyboardist Jeff Babko from the Jimmy Kimmel Live house band. Steve Martin is one of the best-known talents in entertainment, having earned an Academy Award, five Grammy® Awards, an Emmy Award, the Mark Twain Award, and the Kennedy Center Honors. After his Emmy-winning start on The Smothers Brothers Comedy Hour in the 1960s, he became a household name through his stand-up performances on The Tonight Show Starring Johnny Carson and Saturday Night Live, and later a film star with roles in such classics as The Jerk, Father of the Bride, and Planes Trains & Automobiles. Martin also is an accomplished bluegrass banjoist, composer, and author. Martin Short has won fans and accolades in television, film, and theater since his breakout season on Saturday Night Live over 30 years ago. He became an SNL fan favorite for his portrayal of characters such as Ed Grimley, lawyer Nathan Thurm, and “legendary songwriter” Irving Cohen,before crossing over into feature films and Emmy and Tony Award-winning acting roles. Short’s New York Times bestselling memoir, I Must Say: My Life as a Humble Comedy Legend, was published in 2014. In 2018, Martin and Short’s Netflix special An Evening You Will Forget for the Rest of Your Life received four Emmy nominations. The performance, part of the 2019-20 Center Presents Season, is set for 7:30 p.m. Thursday, Sept. 26, at the Palladium. Tickets starting at $50 are on sale now to the general public at TheCenterPresents.org, by phone at (317) 843-3800, or at the Palladium Box Office, 1 Center Green, Carmel. Tickets also will be available when subscription packages for the 2019-20 Center Presents Season go on sale in May.